SAN DIEGO, Calif. /California Newswire/ — ReverseVision Inc. today announced it has been named a finalist for the 2014 Lenders' Choice Award by Mortgage Technology magazine. ReverseVision is the leading provider of business solutions for the reverse industry offering such products as RV Exchange (RVX), the lending system of record for the majority of reverse mortgage lenders; and RV University, the premier online training for the reverse mortgage industry. "Being named a 2014 Lenders' Choice finalist is a validation of how ReverseVision has modeled its business on serving both its customers and the reverse marketplace," said ReverseVision president John Button. "ReverseVision is and will always be a lender-centric, solutions-driven company that is laser-focused on streamlining reverse mortgage lending." Mortgage Technology magazine, which sponsors the annual Mortgage Technology Awards, describes The Lenders Choice Award as "the one category of the Mortgage Technology Awards where professionals from mortgage lending and servicing companies vote for and select the vendors that will be named the finalists and winner of the award." Voters ranked three vendors based on their combined, overall assessment of the following criteria: best customer service, value proposition and overall user experience. "Being recognized by the annual Mortgage Technology Awards is a real achievement, but the Lenders' Choice Award designation carries special significance since it reflects the voice of the lenders and brokers who use our RVX product," said ReverseVision executive vice president Rob Katz. All winners will be announced at the MBA National in Las Vegas October 19, 2014. ReverseVision, Inc. ( http://reversevision.com/ ) is the leading software and technology provider for the reverse mortgage industry offering products and services focused exclusively on reverse mortgages. More reverse mortgages are originated monthly using ReverseVision's RV Exchange platform than all other systems combined. ReverseVision has partnered with some of the finest and fastest growing lending organizations in the U.S. to provide the leading reverse mortgage technology to brokers, correspondents, lenders and investors. ReverseVision is recognized as a driving innovator in the reverse mortgage industry. 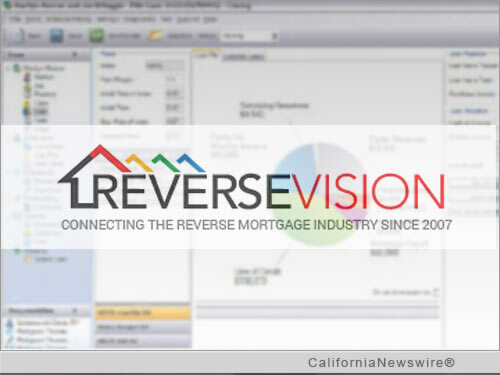 ReverseVision continues to improve their software with frequent new innovations building on pioneering capabilities in reverse mortgage interactive graphs, scenario analysis, multi-environment performance analysis and workflow in the origination process.